• You don’t know what your shaft and clubface look like at the top of your swing. • You only know something’s wrong because your ballstriking is inconsistent. A solid finish to your backswing, with your shoulders turned more than your hips (close to twice as much), your hands as far from your head as possible, and the clubface sitting on the same angle as your left arm. Like most golfers, you get your swing off to a decent start, and reach the midpoint of your backswing with your wrists fully hinged and a good shoulder and hip turn away from the ball. Then your swing shape folds like a bad poker hand because you stop making a solid turn and simply lift your arms. Once you reach midway back, your arms have basically finished their work. 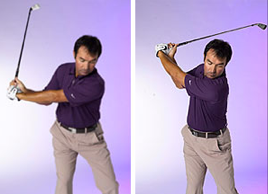 The secret to getting the club up and looking picture-perfect at the top is to continue your shoulder rotation. Think “turn,” not “lift.” A good feeling to have is that you’re moving your left shoulder into your chin. You’ll know you’re doing it correctly when you feel a stretch in the left side of your torso. By turning to the top instead of lifting your arms, you’ll have a better shot at setting the shaft and clubface on plane and getting your hands as far from your head as possible. This increase in swing width will help add yards to your iron shots.